Die Lunæ, 22 Decembris, 1645. It is Ordered, That it be left to the Earl of Pembroke, who hath an Interest in those Manors, to make whom he please Steward of the said Manors, notwithstanding the said Order: And that the said Order, as to Mr. Nathanael Snape, therein mentioned, be repealed, and made void. Letters from Colonel Morgan and Colonel Birch, of Decembris 18 1645, relating the Taking of Hereford, were this Day read. And the Messengers employed, one from Colonel Morgan, and the other from Colonel Birch, were both called in; and related the Manner of the Surprisal and Taking in of the said Town. Resolved, &c. That Mr. Watson, Secretary to Colonel Morgan, Governor of Gloucester, shall have Thirty Pounds bestowed upon him for his Pains in Bringing of this good News of taking Hereford. Resolved, &c. That Colonel Birche's Man, that was employed from him to bring the good News of taking Hereford, shall have Twenty Pounds bestowed upon him for his Pains and Encouragement. 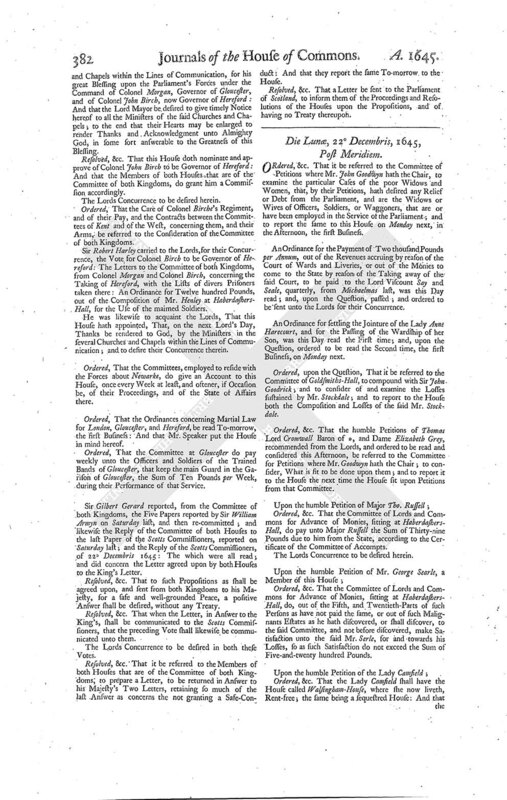 An Ordinance for uniting certain Churches, and for Maintenance of Preaching Ministers in the City of Gloucester, was this Day read the First and Second time; and, upon the Question, committed unto Mr. Pury, Sir Thomas Widdrington, Mr. Wheeler, Mr. Tate, Sir Henry Vane junior, Sir Walter Erle, Mr. Samuel Browne, Mr. Thorpe, Mr. Recorder, Mr. Sollicitor, Mr. Maynard, Mr. Selden, Mr. Boys, Mr. Greene, Mr. Edward Stephens, Mr. Millington, Sir Robert Harley, Mr. Ellys, Mr. Stoughton, Mr. Corbett, the Knights and Burgesses of Gloucestershire, and of Gloucester, and all the Lawyers of the House: And are to meet To-morrow in the Afternoon at Two of the Clock, in the Exchequer-Chamber; and so de die in diem, as they shall think fit: And have Power to send for Parties, Witnesses, Charters, Papers, and Records. Sir Gilbert Gerard reports, from the Committee of both Kingdoms, a Letter from Colonel Morgan and Colonel Birch, of 18 Decembris 1645, from Hereford; with a List, inclosed, of divers Prisoners taken there: Also Two other Letters, of the same Date, from thence; the one from the said Colonel Morgan, the other from the said Colonel Birch; with another List of divers Prisoners likewise taken there: Which several Letters were directed to the said Committee; and were all of them read; and were concerning the Taking in of Hereford. Ordered, That Six thousand Pounds be charged upon the Excise, to be paid, in Course, or out of the Intervals of the said Receipts, which shall first happen, unto Mr. Walter Frost, Secretary to the Committee of both Kingdoms, to be disposed of as the said Committee of both Kingdoms shall think fit: And that Mr. Greene, Mr. Pury, and Mr. Prideaux, do take care of the speedy Raising and Procuring of this Money; and bring in an Ordinance for the Payment of the said Six thousand Pounds accordingly. Ordered, That, out of the Six thousand Pounds this Day charged upon the Excise, and appointed to be paid to Mr. Walter Frost, the Committee of both Kingdoms do give Order for the Payment of the Thirty Pounds, and the Twenty Pounds, ordered to be bestowed on Mr. Watson, and Colonel Birche's Servant, who brought the Letters and good News of the Taking in of Hereford. Resolved, &c. That, on the next Lord's Day, publick Thanks be given unto Almighty God, in all the Churches and Chapels within the Lines of Communication, for his great Blessing upon the Parliament's Forces under the Command of Colonel Morgan, Governor of Gloucester, and of Colonel John Birch, now Governor of Hereford: And that the Lord Mayor be desired to give timely Notice hereof to all the Ministers of the said Churches and Chapels; to the end that their Hearts may be enlarged to render Thanks and Acknowledgment unto Almighty God, in some sort answerable to the Greatness of this Blessing. Resolved, &c. That this House doth nominate and approve of Colonel John Birch to be Governor of Hereford: And that the Members of both Houses that are of the Committee of both Kingdoms, do grant him a Commission accordingly. Ordered, That the Care of Colonel Birche's Regiment, and of their Pay, and the Contracts between the Committees of Kent and of the West, concerning them, and their Arms, be referred to the Consideration of the Committee of both Kingdoms. Sir Robert Harley carried to the Lords, for their Concurrence, the Vote for Colonel Birch to be Governor of Hereford: The Letters to the Committee of both Kingdoms, from Colonel Morgan and Colonel Birch, concerning the Taking of Hereford, with the Lists of divers Prisoners taken there: An Ordinance for Twelve hundred Pounds, out of the Composition of Mr. Henley at HaberdashersHall, for the Use of the maimed Soldiers. He was likewise to acquaint the Lords, That this House hath appointed, That, on the next Lord's Day, Thanks be rendered to God, by the Ministers in the several Churches and Chapels within the Lines of Communication; and to desire their Concurrence therein. Ordered, That the Committees, employed to reside with the Forces about Newarke, do give an Account to this House, once every Week at least, and oftener, if Occasion be, of their Proceedings, and of the State of Affairs there. Ordered, That the Ordinances concerning Martial Law for London, Gloucester, and Hereford, be read To-morrow, the first Business: And that Mr. Speaker put the House in mind hereof. Ordered, That the Committee at Gloucester do pay weekly unto the Officers and Soldiers of the Trained Bands of Gloucester, that keep the main Guard in the Garison of Gloucester, the Sum of Ten Pounds per Week, during their Performance of that Service. Sir Gilbert Gerard reported, from the Committee of both Kingdoms, the Five Papers reported by Sir William Armyn on Saturday last, and then re-committed; and likewise the Reply of the Committee of both Houses to the last Paper of the Scotts Commissioners, reported on Saturday last; and the Reply of the Scotts Commissioners, of 22 Decembris 1645: The which were all read; and did concern the Letter agreed upon by both Houses to the King's Letter. Resolved, &c. That to such Propositions as shall be agreed upon, and sent from both Kingdoms to his Majesty, for a safe and well-grounded Peace, a positive Answer shall be desired, without any Treaty. Resolved, &c. That when the Letter, in Answer to the King's, shall be communicated to the Scotts Commissioners, that the preceding Vote shall likewise be communicated unto them. The Lords Concurrence to be desired in both these Votes. Resolved, &c. That it be referred to the Members of both Houses that are of the Committee of both Kingdoms; to prepare a Letter, to be returned in Answer to his Majesty's Two Letters, retaining so much of the last Answer as concerns the not granting a Safe-Conduct: And that they report the same To-morrow to the House. Resolved, &c. That a Letter be sent to the Parliament of Scotland, to inform them of the Proceedings and Resolutions of the Houses upon the Propositions, and of having no Treaty thereupon. ORdered, &c. That it be referred to the Committee of Petitions where Mr. John Goodwyn hath the Chair, to examine the particular Cases of the poor Widows and Women, that, by their Petitions, hath desired any Relief or Debt from the Parliament, and are the Widows or Wives of Officers, Soldiers, or Waggoners, that are or have been employed in the Service of the Parliament; and to report the same to this House on Monday next, in the Afternoon, the first Business. 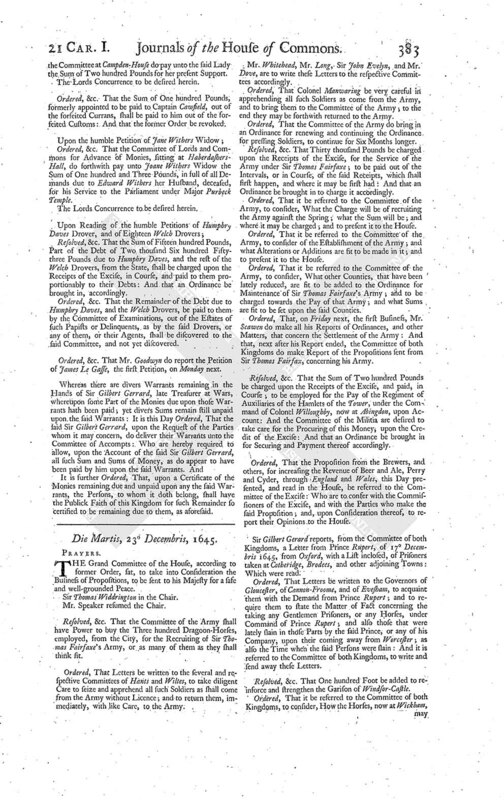 An Ordinance for the Payment of Two thousand Pounds per Annum, out of the Revenues accruing by reason of the Court of Wards and Liveries, or out of the Monies to come to the State by reason of the Taking away of the said Court, to be paid to the Lord Viscount Say and Seale, quarterly, from Michaelmas last, was this Day read; and, upon the Question, passed; and ordered to be sent unto the Lords for their Concurrence. An Ordinance for settling the Jointure of the Lady Anne Harecourt, and for the Passing of the Wardship of her Son, was this Day read the First time; and, upon the Question, ordered to be read the Second time, the first Business, on Monday next. Ordered, upon the Question, That it be referred to the Committee of Goldsmiths-Hall, to compound with Sir John Goodrick; and to consider of and examine the Losses sustained by Mr. Stockdale; and to report to the House both the Composition and Losses of the said Mr. Stockdale. Ordered, &c. That the humble Petitions of Thomas Lord Cromwall Baron of *, and Dame Elizabeth Grey, recommended from the Lords, and ordered to be read and considered this Afternoon, be referred to the Committee for Petitions where Mr. Goodwyn hath the Chair; to consider, What is fit to be done upon them; and to report it to the House the next time the House sit upon Petitions from that Committee. Ordered, &c. That the Committee of Lords and Commons for Advance of Monies, sitting at HaberdashersHall, do pay unto Major Russell the Sum of Thirty-nine Pounds due to him from the State, according to the Certificate of the Committee of Accompts. 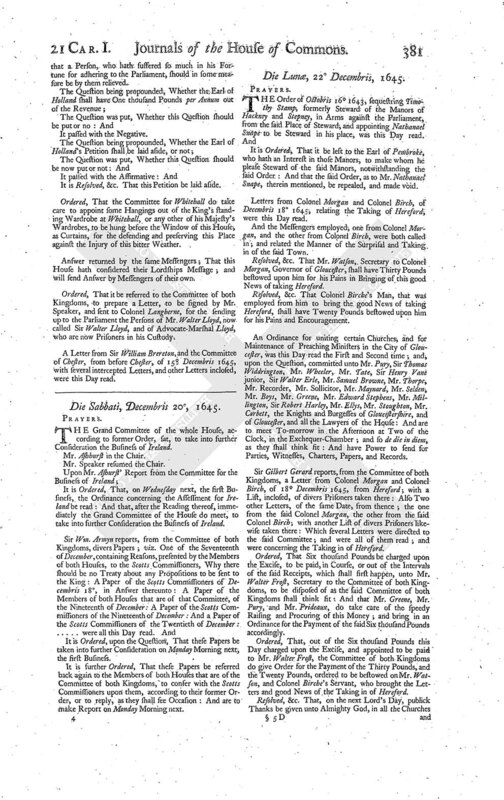 Ordered, &c. That the Committee of Lords and Commons for Advance of Monies, sitting at HaberdashersHall, do, out of the Fifth, and Twentieth-Parts of such Persons as have not paid the same, or out of such Malignants Estates as he hath discovered, or shall discover, to the said Committee, and not before discovered, make Satisfaction unto the said Mr. Serle, for and towards his Losses, so as such Satisfaction do not exceed the Sum of Five-and-twenty hundred Pounds. Ordered, &c. That the Lady Camfield shall have the House called Walsingham-House, where she now liveth, Rent-free; the same being a sequestred House: And that the Committee at Campden-House do pay unto the said Lady the Sum of Two hundred Pounds for her present Support. Ordered, &c. That the Sum of One hundred Pounds, formerly appointed to be paid to Captain Cawfield, out of the forfeited Currans, shall be paid to him out of the forfeited Customs: And that the former Order be revoked. Ordered, &c. That the Committee of Lords and Commons for Advance of Monies, sitting at HaberdashersHall, do forthwith pay unto Joane Withers Widow the Sum of One hundred and Three Pounds, in full of all Demands due to Edward Withers her Husband, deceased, for his Service to the Parliament under Major Purbeck Temple. Resolved, &c. That the Sum of Fifteen hundred Pounds, Part of the Debt of Two thousand Six hundred Fiftythree Pounds due to Humphry Daves, and the rest of the Welch Drovers, from the State, shall be charged upon the Receipts of the Excise, in Course, and paid to them proportionably to their Debts: And that an Ordinance be brought in, accordingly. Ordered, &c. That the Remainder of the Debt due to Humphry Daves, and the Welch Drovers, be paid to them by the Committee of Examinations, out of the Estates of such Papists or Delinquents, as by the said Drovers, or any of them, or their Agents, shall be discovered to the said Committee, and not yet discovered. Ordered, &c. That Mr. Goodwyn do report the Petition of James Le Gasse, the first Petition, on Monday next. It is further Ordered, That, upon a Certificate of the Monies remaining due and unpaid upon any the said Warrants, the Persons, to whom it doth belong, shall have the Publick Faith of this Kingdom for such Remainder so certified to be remaining due to them, as aforesaid.